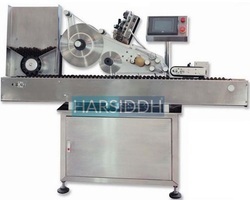 Leading Manufacturer of vertical ampoule sticker labeling machine from Ahmedabad. We have gained wide recognizance in the market as forerunner firm manufacturing and supplying Vertical Ampoule Sticker Labeling Machine. Our offered machines have been much applauded in the market for their sturdiness and precision engineered design. We fabricate these machines as per current industrial norms by utilizing fine-grade steel and high-end technology. In addition to this, we provide these products to our customers in durable packaging at nominal price range.